Welcome to my jewelry and accessories boutique! I have set up my storefront very simply because it will be changing so often. In addition to my jewelry designs there will be other accessories soon, including fashion belts, handbags and beaded tops. Each handmade jewelry or accessory piece is unique and one of a kind, so please "come in" often to see what's for sale. There are many types of quartz, including amethyst, tigerseye and rose quartz. Rose quartz is pale pink, opaque and lightly textured, making it neutral and elegant, yet simple enough to wear with shorts or jeans. This small collection is pretty and fun, with chocolate and pale faux pearls accenting the quartz. Of the many colors of quartz, rose is my favorite, so soft and feminine. 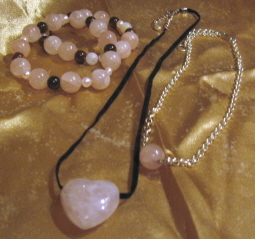 The first piece is a highly polished 10 mm rose quartz heart on 17 in. black polysuede ribbon with 2.5 in. silvertone extender chain with pearly pink "teardrop" on the end and a lobster claw clasp. $14.99 plus S&H (see order form for shipping details). The next piece is an approx. 10 mm polished rose quartz bead on 17 inch silver rolo link chain with easy hook closure. This look is popular with teens, so I have added a ring so that it can be hooked at 14 inches or fully extended to 17 inches. $9.99 plus S&H. (see order form for details). 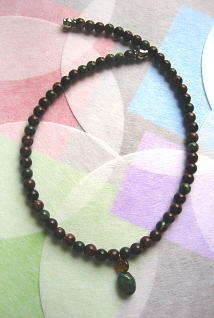 Two stretch bracelets approx. 7.5 in. with varied sizes of rose quartz beads, brown acrylic beads and faux pink pearls on heavy elastic cord for comfortable, safe stretch. $15.99 each or $27.50 per set of two, plus S&H (see order form for details). Tigerseye is a well-known type of quartz. This gorgeous necklace takes your breath away; the tigerseye trillion beads actually glow with their brown/gold opalescence. This 17" choker with a 3" sterling extension is definitely formal, and would be a lovely necklace to wear to a special occasion. $53.00 plus S&H (see order form for details). This pretty necklace, earrings and bracelet set is made of polished genuine sodalite beads with silvertone spacer beads and silver findings. 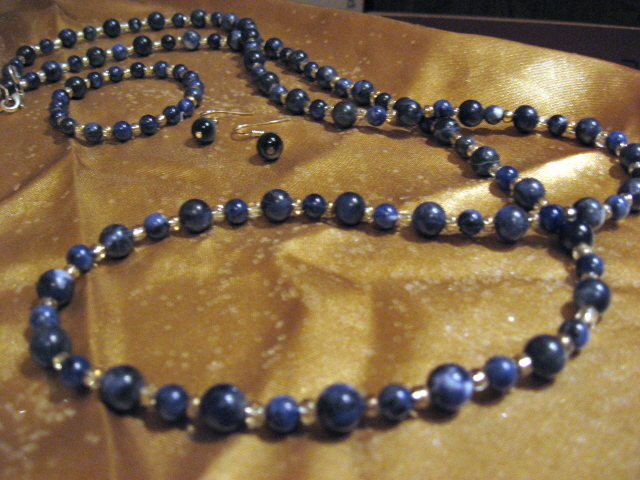 The necklace is about 32 inches long; the earrings are approx. 1/2 in. drops, and the matching bracelet is stetch. The set is $44.00 plus S&H (see order form details). Sorry, this is one-of-a-kind and is only sold as a set. This is one of the first pieces I made and it is dear to my heart because I used vintage silver and amethyst beads from a beautiful old broken piece and reinvented a romantic choker. Approx. 17" long, it also has tiny faux pearls and a 1/2" faux teardrop shaped amethyst pendant with silver findings and lobster claw closure. 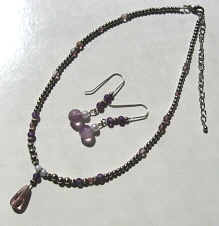 The matching earrings are beautiful french earwires with amethyst beads and faux pearls with approx. 1 1/2" drop. This would make a very nice graduation gift for a young lady (or not so young). A Beautiful neck piece with four highly polished, banded agates colored in combinations of brown, rust, amber, orange and white, with different designs on either side of each large, approx. 1 1/4 in. x 1 1/4 in. rectangular bead. 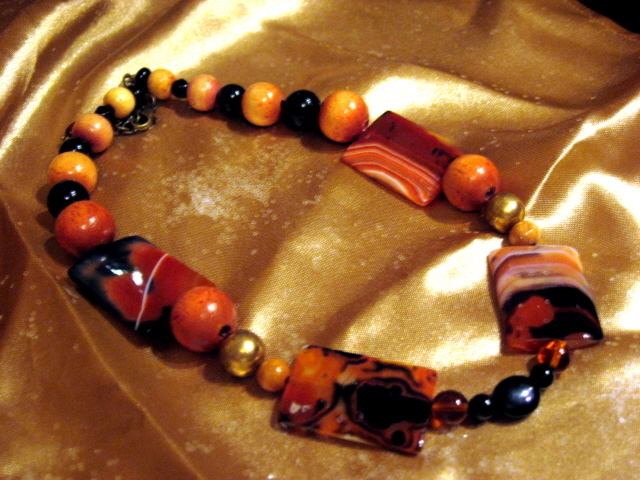 Accented with jasper beads and white quartz beads, amber acrylic disks, polished wood beads, and black glass beads, it is approx. 18" long with antique brass lobster claw closure and 2 in. extender chain. Russet acrylic teardrops, black glass beads and horsehair jasper beads on brass finish earwires to match both this set and the other banded agate necklace. This set is colorful, yet neutral enough to go well with anything from casual fall jewel tones to a black or brown business suit. The rust, black and brown are very versatile together. $43.50 for set, or, sold separately, the earrings can work with many outfits. $35.00 for necklace plus S&H; See the earrings grouped with others below for your convenience. You'll find many pairs and be mixed and matched with several other pieces. (See order form for S&H details). Four genuine, unenhanced, highly polished banded agate rectangles, approx. 1 in. x 1 1/4 in. 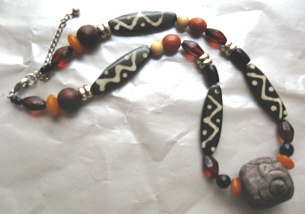 in shades of rust, black, orange, brown and white; complimented with polished wood beads, amber and black glass beads, and antiqued brass metal beads. Creates a very chic and modern look with just about any outfit, dressed up or down. Approx. 17 1/4 inches long, with antique brass finish findings including lobster claw clasp and 2 inch extender chain. $34.99 plus S&H (see order form). 17 inch necklace of silver chain and small, pale gray faux pearls, with iolite and rose quartz chips, quartz beads, faux smoky quartz faceted round beads and teardrops with sterling and pink jasper bead accents. 2 in. silvertone extender chain and lobster claw clasp. The 1 1/8 in. drop pendant is a faceted rhodocrosite with a teardrop shaped painted agate. There are matching earrings shown in the showcase below which are 1/2 in. faceted faux smoky quartz on silver french earwires, for a 1 in. total drop length. The colors in this necklace are soft watercolor shades, making it look victorian. It can be worn with nearly any color. Set is $37.00, or $35.00 for necklace and $5.50 for earrings, plus S&H (see order form for details). You'll get noticed in that black dress and this elegant, genuine turquoise nugget and carnelian bead necklace. Turquoise pieces are large nuggets, NOT chips, accented by shining silverplated metal accent pieces and a variety of silver spacers. Approx. 17 3/4 inches long, with silverplate findings including large lobster claw closure and 2.5 inch extender chain. $44.00 plus S&H (see order form). This 16 in. choker is a lovely pink and grey, made of pink dyed jasper beads with rose quartz beads and chips and faux pink pearl accents. The pendant is approx. a l in. 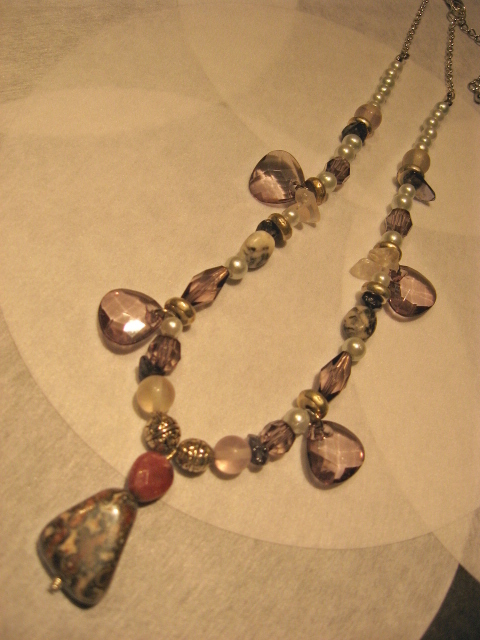 drop of faceted gray and pink dyed jasper. The findings are silver with a lobster claw clasp and 2 l/2 in. extension chain. $33.00 plus S&H (see order form for details). This beautiful necklace is genuine turquoise and red jasper beads with a turquoise cross slide which can be worn with the cross turned to either side. The findings and lobster claw clasp are sterling silver with a 3 in. extender chain. $48.00 plus S&H (see order form for details). Gorgeous genuine turquoise stones, beautifully matched in color, strung between brown agate beads. The 3/4 in. 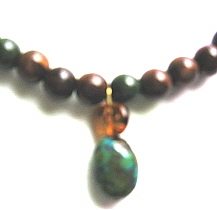 pendant (closeup) is made of a nugget of honey amber and a larger turquoise piece. It is approx. 16 in. in length, perfect for a blouse or shirt collar, with magnetic closure that makes it so easy to wear. 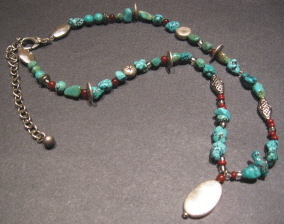 genuine turquoise and "turquoise-like" amazonite, strung with white pearlized beads, jasper chips, and silverplated beads and findings, in an attractive, modern shape. Toggle closure hangs in the front with a genuine turquoise heart-shaped cabochon charm set in sterling on one side and an approx. 1/2 in. faux turquoise nugget at the end. The set includes three matching turquoise and white beaded stretch bracelets. $29.50 plus S&H (see order form for details). This is a lovely, dressy necklace and earrings of highly polished onyx and faceted amber colored stones with golden amber crystals to add sparkle and shine. The pendant has a 1 3/4 inch drop, on a woven silk-like polyester cord with gold findings and a 2 inch extender chain, with lobster claw clasp. The matching earrings have the same pattern of gems with approx. 1 3/4 inch drop on golden earwires. $34.50 for the necklace plus S&H (see order form for details), and $11.99 for the earrings with onyx teardrops, plus S&H (see order form). 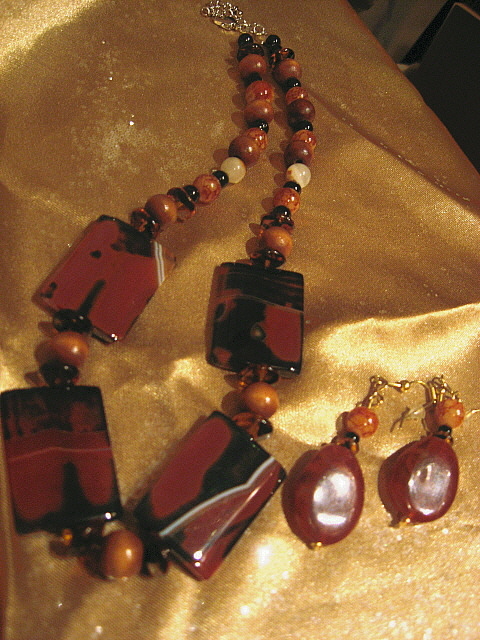 A chunky, boho look, this set includes an enhanced orange shell necklace, a longer necklace, and matching earrings. The necklaces are respectively, 22 inches with silverplated lobster claw clasp and 3 inch extender; and 28.5 inches (endless) with no clasp. The earrings have a 1 1/2 inch drop. The necklaces are made of bone, mixed jasper, baltic honey amber, multi types of quartz, faux pearls, and metal beads with silverplate findings. The earrings are french wires which repeat some of the green and orange glass and acrylic beads and metal spacers. This look is what you'll see on runways and in fashion catalogs (for a lot higher price). It's young and modern, and takes me back to the 70's. $58.00 for the set of 2 necklaces and earrings, plus S&H (see order form). This item is only sold as a set. These hoop earrings are versatile and sure to get noticed. The onyx and jasper chips look great with neutrals, and most of the necklaces below, and the teal bead hoops with dyed coin pearls go well with black and brown as well as aqua colors. $15.99 each, plus S&H (see order form for details). This tribal theme necklace of faux bone, acrylic and wood beads with silverplated spacer beads and a petrified piece of wood as a pendant is right on trend. Approx. 16 in. long with sterling silver lobster claw and 3 in. extender. This necklace looks just as good with a neutral blazer as with your blue jeans and white blouse. $35.00 plus S&H (see order form details). This boho style choker is 16 inches of handpainted turquoise wood and metal beads accented with gold, along with various other metal beads and a large faux turquoise drop pendant approx. 1 inch long. Faux turquoise earrings to match on gold earwires with approx. 1 1/4 inch drop. This piece looks striking on, and very vintage with antique gold finish findings, and has a 2 inch extension with easy hook closure. $30.00 plus S&H (see order form for details). Beautiful, sterling silver slide with one inch lapis lazuli cabochon in sterling silver hung from beautiful bronze and slate blue beads. Will fit a large omega chain as well for a different, shorter look. This necklace is beautiful with brown or anything from light blue denim to a blue print dress. Silver findings with 2 inch extender and lobster claw clasp. $40.00 plus S&H (see order form for details). Here is a necklace and two sets of earrings with a popular geometric theme. 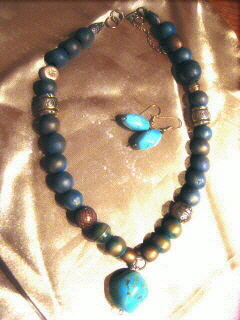 The necklace and earrings shown together are sold separately. All are silvertone circles and chains. The necklace is about 18 in. long with the three circles making an approx. 1 7/8 in. drop, with lobster claw closure and 2 in. extender. The chains and circles earrings have a longer 2 l/4 in. drop, and the double circles are approx. 1 1/4 in drop. The necklace alone is $17.50 plus S&H and the earrings are $12.50 each plus S&H (see order form for details on shipping). Thanks for Shopping! More to Come. . .